1 What is a heart beat anyway and where does this abnormal beat fit in? Palpitations. Skipped beats, extra beats, ectopic beats, Premature Atrial contractions PAC’s, Premature Ventricular Contraction’s PVC’s, missed beats, late beats. What is a heart beat anyway and where does this abnormal beat fit in? We’ve all heard lubdub, lubdub, the normal, steady, reassuring sound of a heart beat. How many of us have been lulled to sleep by first our Mum’s heartbeat and maybe later in life enjoying hearing a new lovers heart beat and then the excitement of seeing and hearing a new baby’s heart beat on the scan. Our hearts – the centre of where we perceive life to begin and end. Your heart is programmed and built to last. It will beat about 100,800 times a day or 705,600 times a week. That’s about 254,016,000 times a year. Honestly speaking – how many of these beats do you really feel? The heart works on a fully independent and automatic system. It does not need us to be aware of its function and it doesn’t use any part of the active brain either. You can be brain dead but your heart will still be going strong. Each normal beat starts with the SA node (sinoatrial node) which is our natural pacemaker. This node sends out automatic electrical impulses through the top chamber (the atrium) causing it to contract and pump the blood through a valve into the bottom chamber (the ventricle). 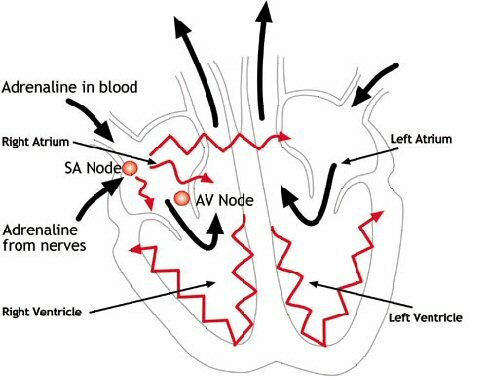 As the electrical impulse is then conducted to the ventricles through a form of ‘junction box’ called the AV node (atrioventricular node), the impulse spreads across the ventricles, causing these muscles to contract and to pump out the blood. The blood from the right ventricle gets pumped to the lungs to be re-oxygenated from our breath, and the blood from the left ventricle goes round the body via the aorta. An ectopic (out of place) beat refers to a contraction of the upper heart chamber which occurs before it would be expected. It happens when something i.e. adrenaline stimulates an early contraction of the heart muscle not stimulated by the SA node. If a person is aware of the event,and many people who get them are not aware of them at all, the first symptom of an ectopic is usually a feeling that the heart has skipped or missed a beat. This is often accompanied by a feeling that the heart is thumping or pounding in the chest. The thumping or pounding is caused by the fact that when there is an ectopic which is not strong enough to clear the chamber of blood, thus the pause before the next beat is usually longer than normal allowing the SA to continue in its routine as normal. The next beat must be stronger than usual to pump the extra accumulated blood out of the chamber. If you like an easier example is when you have 2 drummers. One beats a steady beat , occasionally changing cadence to go faster or slower but the beat remains steady – This is your SA node . The second drummer is easily excitable and occasionally in a piece where he should remain silent he cannot resist throwing in the odd beat – an ectopic beat stimulated from the muscle wall. In no way does this drummer affect the steady one who will continue his rhythm regardless of what his colleague is doing. A “butterfly” feeling, a fluttering in the throat, followed by a heavy thump or bang in your chest. After these, normal rhythm is re-established. It is not uncommon to have runs of these lasting 3 or so beats. Stimulants such as those found in decongestants. Pregnancy. There is growing anecdotal documentation that the increase in circulating volume of blood during pregnancy may sometimes very slightly stretch the heart chambers leaving a vulnerable spot where the heart muscle can self stimulate leading to peri pregnancy ectopics but more pronounced post pregnancy ectopics. Menstruating and menopause – These are due to the effects of estrogen and progesterone. Sudden changes of position – mainly squatting or bending down. This is due to blood rushing back into the heart from the body aided by unexpected gravity which may stretch the chambers and set off ectopics. Beta blockers are the medication to try first if these are causing you high levels of aggravation and stress. They may help enormously. It is advisable that everyone with ectopics goes and are correctly checked over medically. There are certain medical conditions that can have ectopics as a symptom and which need to be excluded prior to assumption of anxiety ectopics. This will certainly include an ECG and if you make enough fuss, a 24 hour tape which captures all heart rhythm for a 24 hour period. If your ectopics have disappeared and then returned after a few years of having none than it is wise to be assessed medically again. Having ectopics will not harm you at all as your drummer continues to drum regardless of his colleague. Build yourself up a picture of what your drummers look like so you can visually help yourself keep calm. It takes time to accept that something as disruptive and frightening as ectopics can also be meaningless in terms of your cardiac health. There is absolutely no correlation between skipped beats and increased risk of a heart attack.